The Olympic games have come and gone, and I have not finished the child's sweater I pledged to afghans for Afghans. I ran into technical difficulties, namely running out of yarn. So I had to do this: This is the sleeve. I took a contrasting yarn, a sort of heathery beige, and am making an intarsia stripe up the sleeve. I am not too pleased with this solution, but maybe the finished product won't look too bad. I had planned a saddle sleeve so the saddle will be in the contrast color as will the crew neck. The sweater might have a military look with the saddle mimicking an epaulet. I've had a hard time photographing the color of this sweater, which is a rich blue. This photo comes closest to the color, but it is a touch deeper in person. This project represents two firsts for me. This is the first time I am making a sweater with a saddle shoulder. I am interested to see how it will look. I have the idea that it is a masculine style. I don't think it would look good on me anyway, because I have kind of broad shoulders. But I won't get to find out, because this sweater is sized to fit a chest measurement of about 28 inches. 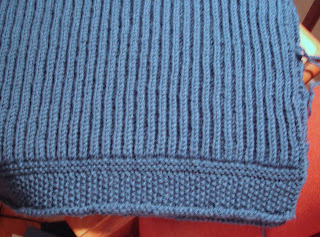 It is also the first time I have used the brioche, a stitch pattern I have long been attracted to. This seemingly simple pattern is remarkably difficult to understand and execute, at least for me. I still don't know if I'm doing it right. My trusty Mon Tricot stitch dictionary says to knit 1 and then knit 1 in the stitch below. This means that the stitch knit below is knit together with the stitch on the needle above it, making it a kind of double stitch. I don't know what's wrong, but my attempts to follow these directions end in mish-mosh. The deranged stitches at the bottom of this scanned swatch show my pathetic attempt to follow the Mon Tricot instructions. So I was very lucky to find this brioche stitch tutorial in an English/Italian blog called Cloudy Crochet. 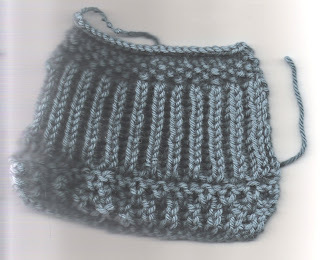 The pattern for this stitch is given as: *yarn over, slip 1, knit 2 together. But you can't take these instructions literally. As Pippa of Cloudy Crochet explains, yarn over in this case means lay the yarn across the needle next to the stitch as if to purl and slip that stitch together with the yarn. This creates a doubled criss-cross sort of stitch that becomes the knit 2 together on the next row. Pippa explains it very well, so if you want to learn this stitch, I strongly recommend her tutorial. The only thing I don't understand yet is why this stitch is considered a multiple of 3. I have it as a multiple of 2, but maybe I am doing something wrong. Lucia, The Knitting Fiend also has a brioche stitch tutorial showing different types of brioche stitches, but I find Pippa's easier to understand. Lucia's is quite comprehensive though. I am glad that, after years of trying, I have finally learned to do the brioche stitch, or at least a reasonable approximation of it. It makes a warm, cuddly fabric that will stand up to a cold Afghan winter. It would make great outerwear in our own centrally heated climate. Your sweater looks like real brioche stitch to me. If you aren't fed up with it yet, another interesting site is The Brioche Stitch (don't know where I picked up this link; I've been saving it forever). She talks about 'burp' and 'bark' rows, which I think means brioche purl and brioche knit, but I could be wrong. Lots of info anyway.